Egypt and Art > Tour Map of Egypt > Tour Philae Directory. 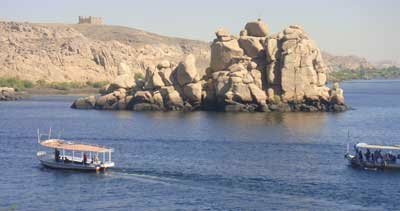 > Approaching The Island of Philae.
. . . .Sometimes called “The Jewel of the Nile” the Island of Philae is home to several monuments including the temple of Hathor and the temple of Isis and Harpocrates (Horus the Child). Many of the monuments are from the Greco-Roman Period. The last hieroglyphic inscription writen in ancient Egypt can be found on this Island, it was made here in 394 A.D. The features that dominate this view of the island are the 1st and 2nd Pylons of the Temple of Isis and the top of the Kiosk of Trajan. 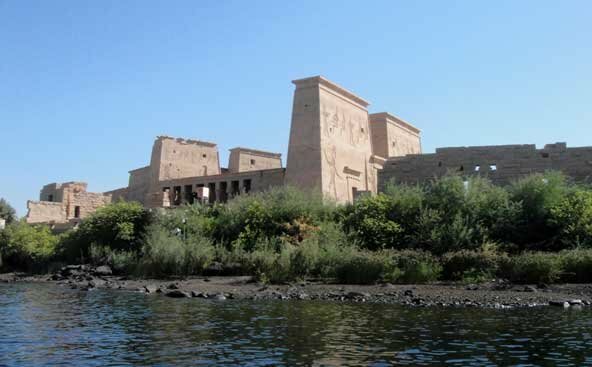 . . . . .Philae was a religious center from the 25th Dynasty well into the Christian era. It is interesting to note that Christianity and the Egyptian cults coexisted here until the cults were suppressed under the Byzantine Emperor Justinian, 527-565 A.D. At this time a great injustice was inflicted upon Egypts legacy. As was the case with many of the Egyptian monuments, the images of gods and kings that were within reach, were systematically defaced.